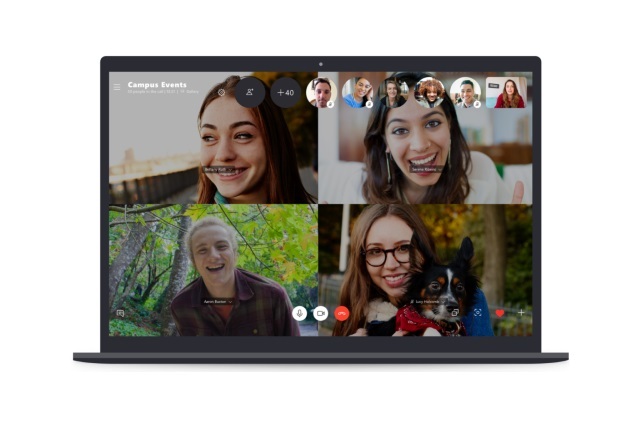 Following a beta test of the feature Microsoft has doubled the number of people that can take part in a Skype chat from 25 to 50 for all users. The option of chatting with up to 49 other people applies to both video and audio chats, and it's something that is probably going to appeal to businesses more than individual users. The increase sees Skype finally catching up with Facebook Messenger, and overtaking Apple's FaceTime. Microsoft acknowledges that increasing the number of chat participants could make things a little tricky and potentially irritating, so the company has made changes to the way notifications work. The company says: "With the increase in the number of participants, we also made a few changes to how these larger calls start". We added a notification to replace the ringing as the default, allowing every member of the group to receive a quick ping to join the call. These notifications are a simple, unobtrusive way to get your calls and meetings (be it between family, friends, podcast guests, or coworkers) started. If the notification of starting a call is not enough, you can select individual members to ring, or if your group is less than 25 participants, you can ring the entire group. You will need to make sure that you are running the very latest version of the app in order to benefit from the changes.